Ground-breaking movement and awareness classes and gentle individual hands-on sessions to enable you to do what you want in life more easily. We could say that an actor is engaged in an examination of human behaviour, couldn’t we: exploring and portraying people’s different ways of living and responding to life? But if so, then how much do you, as an actor, know about your own behaviour for a start? If you want to be able to portray how someone else behaves, you need to know as much as you can about how you behave first or how can you make any kind of choice about what to do differently? Its notoriously difficult. How do we even approach something that difficult to grasp? Behaviour involves thinking, feeling and doing. Feldenkrais would argue that those things are different aspects of the same thing and that investigating one affects them all. Of those perhaps the most accessible, least abstract or subjective is ‘doing’. It’s something you can look at, explore, notice differences and play with. It’s not an idea exclusive to Feldenkrais as you may know, but he works with it at an extraordinarily detailed level as it is often subtle details that carry the story our behaviour unwittingly tells. For example: A young actress has a slight tendency to sink in the top ribs at the front just under the collar bone. It’s a small detail but it gives her a slightly unconfident, vulnerable, self-protected look. Surprisingly a director casts her as Lady Macbeth. It’s unusual casting for her, but the director is interested in exploring a less traditional, more fragile Lady M. However there are moments when the director does want her to find a flash of real power. “You need to really take your ground at this point. Stand tall,” The actress cranks herself up by lifting her lower ribs at the front and arching her lower back more which just makes her look a little chesty and tight and cut off in the waist. “No, no. Pull your shoulders back,” says the director. The actress duly pulls her shoulders back. Her collar bones pull tight across the front of her chest, her back is stiff and her throat is compressed. The top ribs are still sinking and it’s hard to talk properly. “No no. Relax more!” the director tells her. She sags. Internally, the director begins to question the wisdom of her casting. The thing is that our actress doesn’t know what she is doing well enough to be able to modify it and the director can’t help her. Until the actress can begin to explore and feel the relationships between her shoulders, chest, back and pelvis she won’t find anything new – and it will always affect her casting or perhaps more importantly, her range and skill within that casting. Feldenkrais uses sequences of small (and sometimes bigger) movements and constraints on movement in unusual ways to enable you to learn to sense the way you organise your whole self to do something and then to open up new possibilities that you may not have imagined before. It takes time and patience but standing up after a feldenkrais lesson on the floor can often feel like a little piece of magic has taken place: nothing feels like it is quite the same, your sense of your weight, how you stand, walk, reach or do the most basic of movements may feel like it is put together differently. Your voice may have a different resonance, your breath may have changed. Sometimes the world and people around you have a different feel to you, your responses change slightly and your presence on stage is affected. It is something you really have to experience to get, but hopefully the book I have written will explain a little more and make you curious enough to try it out and feel the benefits for yourself. 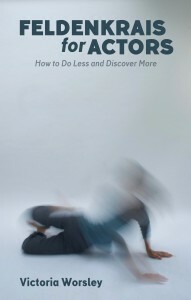 You can buy ‘Feldenkrais for Actors ‘at a 20% discount here.